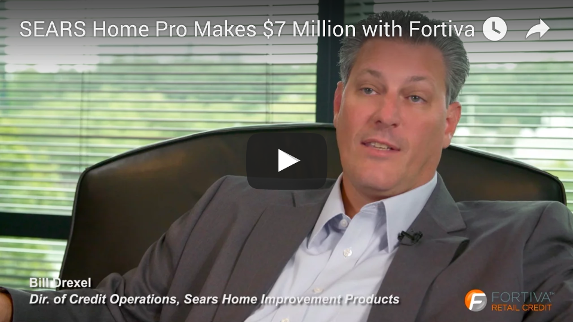 Bill Drexel of Sears (home professional service division) discusses revenue growth after adding Fortiva Retail Credit, the leading second look financing program, to their credit platform. "Since partnering with Fortiva, Sears has increased sales of seven million dollars over this time last year, directly due to being able to capture a credit segment that was previously unattainable.."
Fortiva Retail Credit is the leading second look finance program specialized in approving those customers with less-than-perfect credit scores who are likely to be declined by traditional banks. "We tend to approve anywhere from 20 to 50 percent of prime providers’ declines. Our clients tell us that we’ve increased their bottom line by 8 to 10 percent, or we’ve helped them save markets that otherwise would have closed."